A traditional display of love. 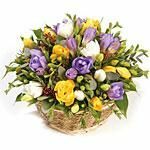 Lilac, white and yellow Freesias combined with lush greenary, in a rustic basket. Please note flowers shown in the picture are for reference only, A substitute can be made depending on availability and season.